Threat: USB Thief, new USB-based data stealing malware. Solution: Disable USB ports were possible and have AUP which enforce care in their use. 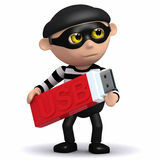 USB Thief is a new USB-based data stealing malware that only uses USB devices for propagation. The malware also uses multi-stage encryption to hide its tracks and make it very difficult to detect. The malware is written in a way that each install is bound to each device, making it difficult to copy and analyze. USB Thief is ideal for attacking isolated (Air-gapped) networks that are not vulnerable to other internet based attacks. It seems this malware has been designed for targeted attacks against specific networks. It is highly advised that staff at all levels undergo cyber security training.